Motion on Mainstreet is located at 2329 W. Main Street in Olde Town Littleton in the Littletown Building. 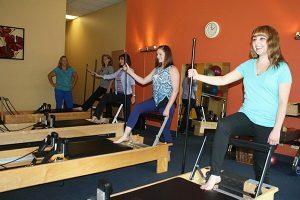 A division of Colorado Center for Physical Therapy, Motion on Mainstreet is southwest metro-Denver’s premier Rehabilitative Pilates studio which provides Pilates Reformer and specialty classes. We offer private Pilates and Yoga Therapy sessions to anyone of any age who is interested in wellness, prevention, or just honing their skill. This includes those looking for valuable additions to their home based exercise program. We assist recreational and serious athletes seeking improved core strength, flexibility & endurance. We help those seeking a more holistic approach to injury or post-surgical rehabilitation. We have been working with professional dancers in the metro-Denver area for 27 years and help athletes of all ages who partake in a wide variety of sporting activities. We also integrate the therapeutic applications and healing philosophies of Joseph Pilates, Yoga in the Himalayan Tradition, and Thomas Hanna’s Somatic Movement Therapy into our injury rehabilitation program. 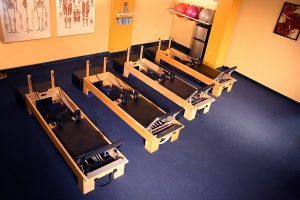 Other specialty programs include Pilates & Gentle Yoga for a Healthier Pregnancy and Clinical Pilates Applications for other challenges such as Multiple Sclerosis, Stroke, Scoliosis, Chronic Fatigue, and more.We keep up with the latest in continuing education and are backed by 34 years of clinical experience. We have helped clients resolve a wide spectrum of pain conditions and rehabilitation challenges. Motion On Mainstreet is established with care and dedicated to providing you with a safe, high quality wellness experience. Motion on Mainstreet is located in Historic Downtown Littleton, south of metro Denver. Our office is in the Littletown Office Building in Olde-Town Littleton. We are located on the northwest corner of Sycamore and Main Street, one block east of Prince Street. The Littleton light rail train station is 1½ blocks south of our location. Our goal is to get you started safely & smartly to maximize your fitness experience!